Teach, Practice and Apply 6th Grade Statistics and Probability Standards with this cross-curricular bundle. 36 pages of full-page, step-by-step Modeled Charts and Instructions to teach and practice each 6th Grade Statistics and Probability standard. Analysis questions encouraging higher level thinking as students apply their math knowledge to climate and settlement patterns in Ancient China. A perfect companion to the study of Ancient Chinese Geography! BONUS 2018 Winter Olympic Medal Count by Country Data Set and blank calculation and graphing templates are also included. 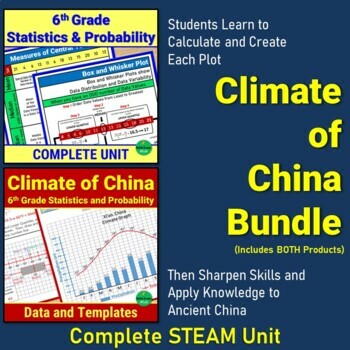 BUNDLE the 6th Grade Statistics and Probability – A Complete Unit with any of the Ancient Culture Climate Data Sets for a complete package of Instruction and Cross-Curricular practice. Purchase these sets if you have already purchased Option #1 or Option #2. Keep skills fresh all year while you enrich students’ geography study of ancient cultures. Thanks for following MIDDLE GRADES MATH on TPT for middle grades math products. RATE THIS PRODUCT and earn valuable TPT credits to offset future purchases. LEAVE A COMMENT and help others purchase with confidence. ©Middle Grades Math. All rights reserved. This resource is for classroom use by one teacher/classroom only. Copying, editing, selling, redistributing, or posting any part of this product on the internet in any form (even a personal/classroom website or blog) is strictly forbidden. This product can, however, be posted on a classroom share site with restricted student only password-protected access. Violations are subject to the penalties of the Digital Millennium Copyright Act.